Tool Trade: Nepalese auto techs share tools and close living quarters as they try to repair smog-belching cars. Jack Sparks went to Nepal to train auto mechanics. He came back an advocate for ethnic artisans. LEGEND HAS IT that the Katmandu Valley was once a great lake until Manjushri, a Buddhist from China, broached the valley with his magical sword and drained the water. In the Hindu version of the legend, the fun-loving Krishna threw the thunderbolt that created the Chobar Gorge. Either way, scientists agree that in the once submerged Katmandu Valley, the rivers now flow southward through the Chobar Gorge. They also concur that in the resulting fertile bowl there is now serious air pollution--a byproduct of 2.5 million people inhabiting a 25-kilometer-wide valley walled in on all sides by rugged, inhospitable mountains. Katmandu Valley's smog problem is what initially drew Jack Sparks, owner of the DMV auto repair clinic in Santa Cruz, to Nepal. As a member of the International Automotive Technicians Network, Sparks received an email from a Nepalese auto technician who was desperate for equipment and training with which to fight the region's air quality problems. Sparks, who was thinking of going into semiretirement doing photography and videography, emailed back, thinking that traveling to Nepal as part of a training team could give him a chance to make an important documentary. But though i-ATN has 37,000 members, Sparks ended up traveling to Nepal alone. "I'd lined up three i-ATN instructors to do the training, but when I got my tickets, they didn't," says Sparks with a laugh. He decided to go ahead with the training anyway. "I figured I could evaluate their needs, bring back the information and open up the path for the next group." Sparks arrived in Katmandu in April 2001, bearing $26,000 in i-ATN donated equipment and training materials plus a lifetime of experience in fixing cars. What he discovered was that Katmandu's air pollution isn't just aggravated by a lack of knowledge about modern cars and testing equipment, but also by the poor quality of Nepalese fuel, which comes from India. Says Sparks, "People suspect that by the time fuel makes it into the gas tank of the average Nepalese car most has been doctored with kerosene. There's no telling where the corruption stops." Sparks asks me what kind of car I drive. "A Honda? Well, if you were to fill your tank with a mixture that's half kerosene, your Honda would be sputtering and on the side of the road with plugged fuel injectors within 500 miles." In Nepal, says Sparks, most repairmen don't know how to test to see if the injectors are plugged or not. "Instead they try to 'sort out' the problem, which means wiggling a wire here and fiddling with a cap there. The truth is that most don't understand fuel injection and black boxes. So they pull out the engine and try to rebuild it. But since they don't even have hoists, a lot of the work ends up on the ground, contaminating the engine worse than if they'd left it alone. And they only get paid for fixing things, not diagnosing problems. And though the police are beginning to do smog analysis, the smog sticker system appears to be corrupt." Walking through the streets of Katmandu is a sensory assault, says Sparks, who returned to Nepal in August 2001. "The colors change every day. One day you see bananas alongside the road. The next day it's cucumbers. The day after, carrots, as different produce comes to town." He says the hot, humid air is heavy with smells of frankincense, flowers, cooking and dust--and also something both strange and familiar. "The first time, I thought it might be a barbecue--until I was informed it was a cremation," says Sparks, recalling how "the wind travels in circles bringing one smell after another. And dust is everywhere. You even feel it between your teeth. And then you see a truck bellowing out black smoke." Walking the garbage-strewn streets, Sparks saw waste passing through open sewers right next to fruit and vegetable stands. He saw children playing at the roadside in torn clothes, while scooters loaded with three, four, five people tore past, as young men boarded a fume-spewing bus on the road to New Delhi. As for the roads, they consist of a disorganized pothole-ridden mess across which cars, bicycles, pedestrians, buses, scooters and even cows wander freely. "You see cows walking along the streets, eating everything, including large volumes of garbage. And because they're sacred, you're in bigger trouble if you hit a cow than a person," says Sparks. Introducing more electric vehicles would help fight pollution, he says, but bumpy roads cause the batteries to blow up, making electric vehicles prohibitively expensive to maintain. "But then I look up and see the mountains that surround the valley, watch clouds spilling over them, and feel the wind," recalls Sparks. "I love it and hate it there." 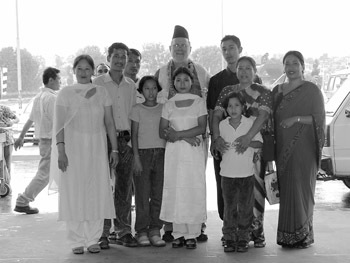 Sparking Fair Trade: Jack Sparks (in hat) at Katmandu Airport with a Newari artisan family. When Sparks taught his first auto repair class in Katmandu, he was surprised at how young most participants were. More disconcerting was the discovery they were living seven to a room. "If they have any mechanical ability, they walk into the first auto repair facility in town and offer to work on the cars. Generally the owner says fine, and shows them a room which they can share with other repairmen." One of Spark's many exquisite photographs of Nepal (he took more than 4,000) shows seven satchels hanging from the wooden rafters of one small room. Below the satchels, seven sets of rumpled blankets lie on a raised wooden board, under which are stuffed the seven young men's few possessions. In one corner of the room is a kerosene stove on which perches a pot of rice. In the other corner sits a TV and an altar to Hindu and Buddhist deities. Beneath the TV and altar is what the men most want to own, but can't afford--a set of tools, which they currently have to share when they repair the cars. "There's a more complete set of tools in the trunk of my car than they have for the entire shop," says Sparks, who in the 1970s ran a cooperative car repair shop in Santa Cruz called the Karmachanic--until somebody stole the tools. "In this same small room is an air compressor, old car parts and solvents," says Sparks, noting that the men draw their drinking water from a well outside their room. He shows me a photograph of the well, pointing out that the water table lies only three to four feet beneath the surface. "Even in this photograph you can see the rainbow effect, which is from the oil which has drained there from the men's repair and cleaning operations," he says. Though these living quarters are squalid by Western standards, Sparks admits that the shop owner is doing his men a favor. "By letting them stay seven in one room, he's saving them from paying rent and starving." Sparks says he had no idea what to expect when he volunteered to travel to Nepal to give the free classes. "I brought all these manuals and diagnostic equipment, but what they really needed was basic training," says Sparks, who taught 21 men three days a week for three weeks. 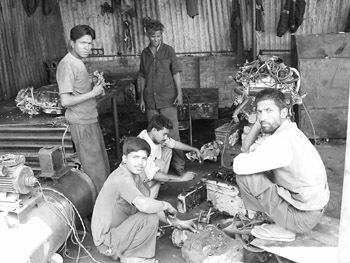 Though he left the training manuals, tools and equipment for the men to use in ongoing classes, a state of emergency has now been declared in Nepal, with the result that all automotive repair classes have been canceled. "If more than four men meet, the monarchical democracy currently in power suspects the meeting of being a potential conspiracy by Maoists--Nepalese nationals who want a socialist country and have already taken over a third of Nepal," explains Sparks, adding that under the new orders, armed soldiers are stationed on every corner. "Basically, all fundamental rights have been suspended." The Maoist insurgency, which has been going on since 1996, has put a damper on the tourism industry, which is reportedly down by 80 percent. "The government opened up over 100 new mountaintops for hikers, but that still wasn't conducive enough, what with Maoists setting off bombs and policemen being killed," says Sparks, adding that 30 journalists have been detained by government officials since November. Because they are doing auto repair, technicians are already treated as a lower caste in Nepal, says Sparks. "But now the economy has gotten so bad that though you have dedicated auto technicians and instructors and plenty of cars in need of repair, the businesses are drowning, forcing many technicians to go to the Middle East, where they'll be treated like third-class citizens, but at least won't starve." Last week, a rebel attack killed 137 people, the worst assault in Nepal's six-year war. Study in Detail: A Newari statue maker painstakingly hand-finishes a religious statue. In-between teaching classes, Sparks played tourist, on one occasion making the trek to the Buddhist shrine at Swayambhunath Stupa--an ornate spire from the square base of which the Buddha's eyes gaze out in four directions. The site inspired Sparks to buy a sacred statue, but a visit to a local market unearthed nothing but crude work. Then his Nepalese friends introduced him to some Newari metal casters, an ethnic group of artisans famous for their artistic skills, including metalwork and sculptures. As Sparks discovered, the same wall of mountains that traps smog in the valley also protected the area from religious intolerance, isolating the oldest living tradition of metal casting in Southeast Asia and allowing Buddhist and Hindu shrines to stand side by side. But now, with tourism down, Sparks found that the casters were starving, their old traditions in danger of dying out. Invited into a seven-story Newari house made of brick, wood and red mud, Sparks climbed a rickety stairwell that resembled a ladder to the fifth floor lit by a single light bulb. "I was invited to sit at the kitchen table where a lone TV was perched, and someone automatically brought me a Coca-Cola because I'm American," says Sparks, who was introduced to an artisan family with many children. But though Sparks loved the exquisitely hand-detailed statues of Hindu and Buddhist deities that the Newars make, he was appalled by the conditions under which they were being produced. Men were getting blisters from handling red-hot statues in makeshift foundries without protective gloves or clothing, in rooms so hot they almost melted Sparks' cameras. In another home men were applying liquid mercury--a highly toxic substance linked to neurological damage--in unventilated rooms full of children and women, then vaporizing the mercury with blowtorches. Another artisan was handworking a statue with dozens of different chisels to finish the finest details. "It takes one Newari three weeks, working 12 hours a day, at less than 10 cents an hour, to carve a statue," says Sparks, who decided to document the statue-making process. "Initially, people weren't comfortable with me taking pictures, afraid I'd steal their methods maybe, but I gained their acceptance by acknowledging and honoring their children," says Sparks, who filmed families sculpting statues in beeswax, covering them with fine clay, drying the molds, melting out the wax and casting them in metal. The procedures take months, including many hours of detailed hand finishing. "Maybe it was because I like metal--being a mechanic--but I also figured this might be a way to effect change," says Sparks, who visited a total of seven Newari family groups to watch production. On returning to Santa Cruz after his second trip, Sparks set about opening Sangralaya (111 Union St., 429.8891), a fair-trade store that will represent the handiwork of 80 artisan families in Katmandu and, he hopes, serve as a cultural bridge between Nepal and the United States. 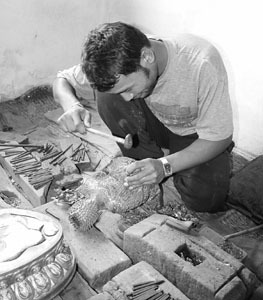 A nonprofit aspect will focus on handicrafts made by families where no child labor is involved, and will help with health, education and welfare, says Sparks, who wants to centralize all the toxicity by having the Nepalese artisans bring their crafts for mercury amalgamation to one location in Katmandu, where they'll have access to protective gloves and masks. Since its November opening, Sangralaya has commissioned 60 statues by providing the raw materials and then paying up front for the finished work. The store, which also carries prayer flags and wheels, singing bowls, incense, photographs, jewelry and postcards, has already sent gloves, masks and ear and eye protection to Nepal--in short, everything to make the casting process safer. Though his store sells products, it's also a place to come chat and meditate, or watch documentary videos, sitting in one of Sparks' reupholstered theater chairs. "It was tough to open a business after Sept. 11," says Sparks, "but it's a good time to set up a place with a spiritual feel where people can come and communicate."